Expansive Views from this top floor condo. As soon as you enter, your dream view is realized, making this the condo you want to rent anytime of the year! The entire unit was remodeled in 2012! Bamboo Wood Floors, New Washer & Dryer, New Stainless Steel Kitchen, New Upscale EVERYTHING! So beautifully decorated and well equipped, everything to make your stay COMFORTABLE and FUN! 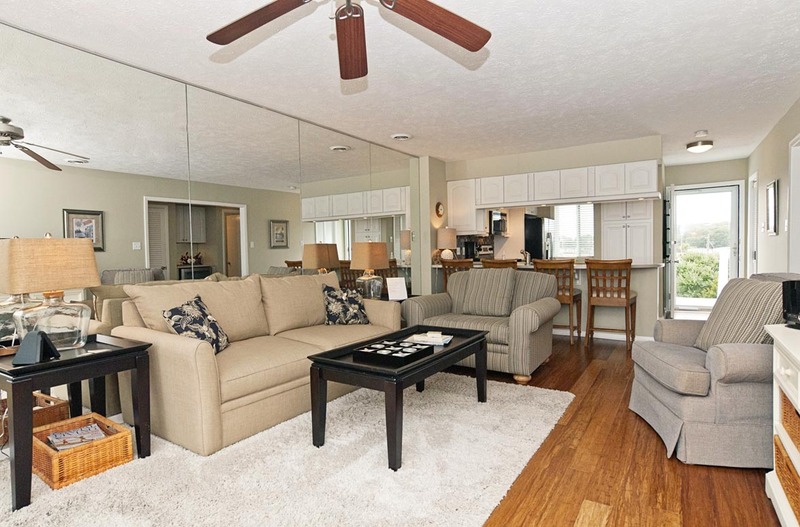 There is so much natural light that comes in from the sliding glass doors inside. Watching the Dolphin from the large deck with your family and friends is an adventure in itself! The deck has plenty of seating for 6! 2 new bar height tables and captain's chairs. Also a relaxing glider to watch the stars above! Each of the following rooms has large flat screen TV! The Master Bedroom has a Queen size bed with a closet, including 2 luggage racks for unpacking and an on-suite full bath with tub and shower. The second bedroom has two twin beds and a closet, also includes 2 luggage racks. The living room includes a new comfy queen size sleeper sofa and a desk to write those postcards or check out Pinterest on your laptop! We do have free WiFi! 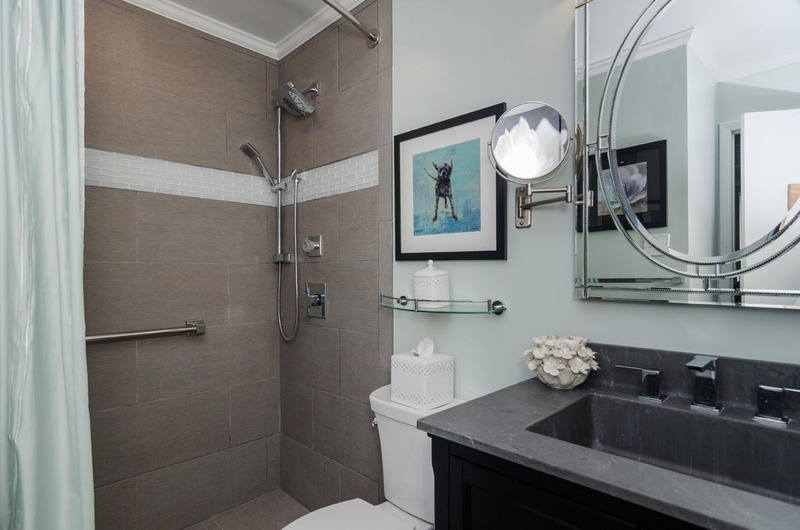 The 2nd bath is located in the hall next to the 2nd bedroom and it also includes a tub and shower. 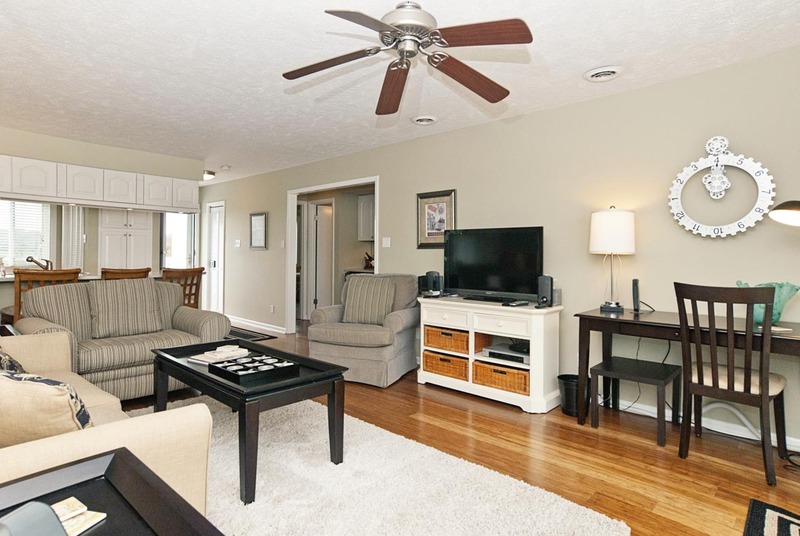 Enjoy wireless connections throughout the condo! 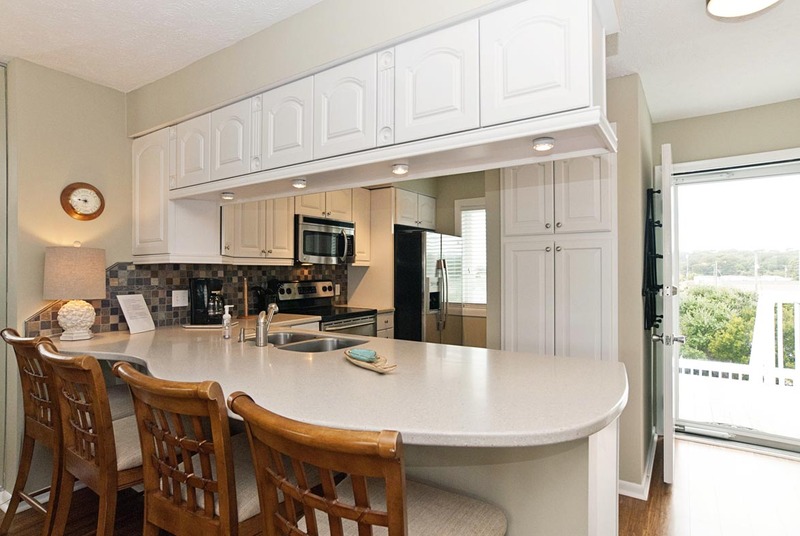 Brand New Kitchen with stainless steel appliances, coffee maker, and Keurig to make a cozy dinner to dine on the deck, complete with captains chairs and dining table, as well as beautiful new Broyhill Furniture on the interior. EVERYTHING you need to Relax and enjoy your Beach time! Wireless Internet, Large Flat Screens in Living Room and Bedrooms. 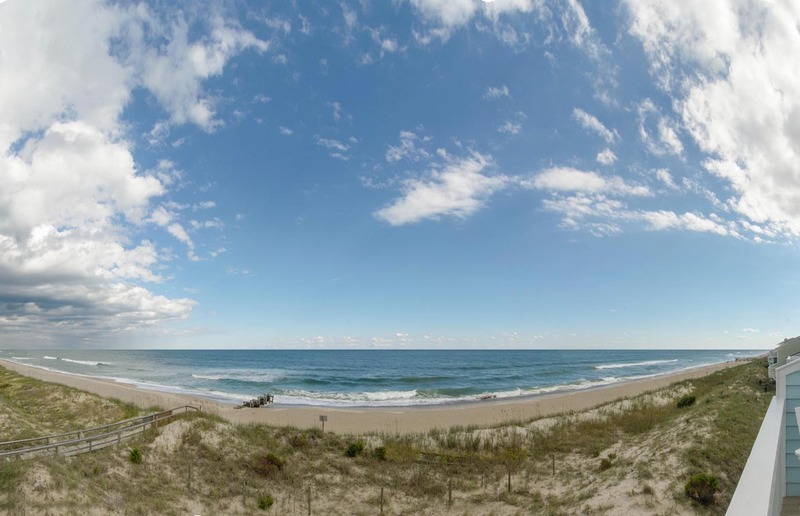 Enjoy the quiet of Kure Beach, only a short distance from the Carolina Beach, restaurants,boardwalk and shops. 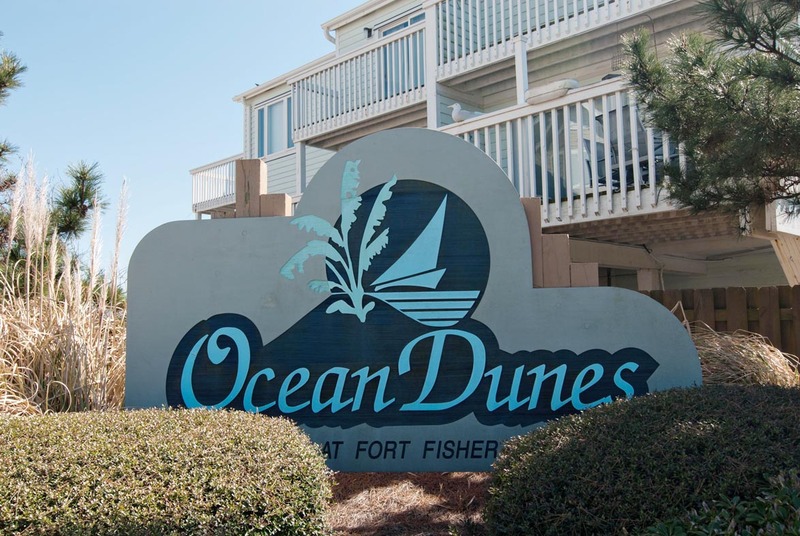 Condo is across the street from the Fort Fisher Recreation Center, down the street from the NC Aquarium and Fort Fisher-Southport Ferry! Beautiful accommodations, love the proximity to the beach and to the pool. 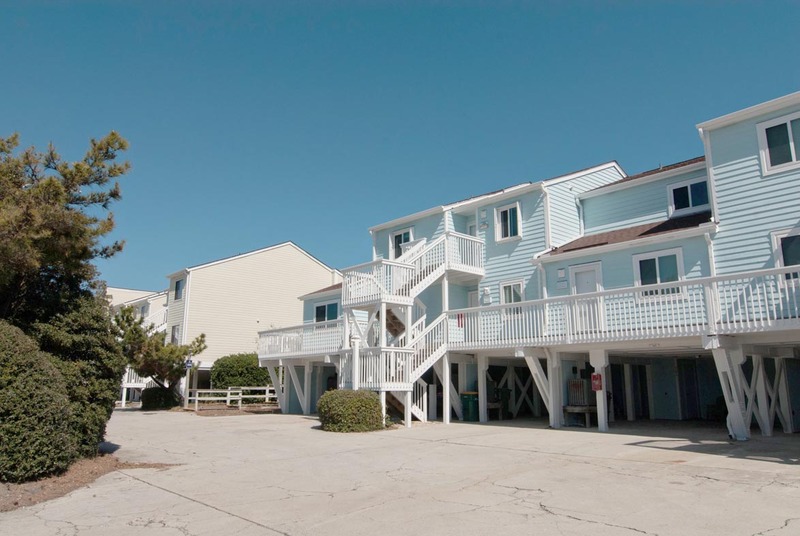 This beautiful oceanside 3rd floor condo was the ideal location to introduce our family to the ocean. The condo is simply decorated and comfortable. A true home away from home. Everything was amazing, loved the location and cleanliness. The condo was right on the beach and newly updated .. it was BEAUTIFUL! My only complaint is to update the what you need to bring list, we brought tons of stuff that we didn’t even use, which was a pain to fit in the car along with our 3 children and all of our stuff. We would definitely not hesitate to rent again. The Bianchi was just wonderful! We've stayed in many condos in the Ocean Dunes community over the last 6 years and this is the nicest so far! It's very well equipped with plenty of seating inside and outside. The beds are comfortable, about a medium softness. There are some books, videos, and a couple of games in the home. The building is located between a beach walkway and a pool, perfect for a quick dip after a hot day on the beach. I can't wait to stay here again! Note to owner, you may want to update the couch cushions in a few years. They seem to be getting a bit worn. Also, check the blankets. there was one we used as a throw that had holes in it. Nothing at all that made a bit of difference to our stay. The couch is still comfy! We had never been to Kure Beach but we like trying new places and took a chance. This condo is beautifully decorated, had everything we needed and had a gorgeous view. We enjoyed the beach, it was also beautiful and we weren't having to fight crowds for a spot on the beach. Everything was perfect until the last day when the maintenance man knocked on the door and said they would be cutting of the water in 20-30 minutes for about 4 hours. That was the only notice we received about this and it was a huge inconvenience. Had we been given better notice, we would have planned out last two days differently. Our plan was to sleep in, do the laundry that needed to be done and cook lunch and dinner there. I had just put my 1st load of laundry in the washer when he knocked on the door, he said 20-30 minutes but it was more like 10 because that 1 load didn't even finish. I had vegetables to wash to cook for lunch and couldn't, we had to use bottled water to fill the kuerig and brush our teeth. It turned out that the water was off for less than the 4 hours we were told but It was a HUGE inconvenience and it really ruined our last day. It would have been fine with notice, we aren't that difficult to deal with. We appreciate your feedback. Unfortunately we had no idea about the water shut off until you contacted us, or we would have let you know in advance, we apologize that it happened during your stay. The Homeowner's Association had to shut off the water to the building for a repair from a broken water line we were told when we called them. Although we did offer the use of another unit for you to go to during the time, but we are happy that the repair did not take as long as expected. This is a beautiful unit and hope that you will visit us again next year. The condo was upgraded since last year and is very nice. The added carpet is good addition. Thank You to Bryant for all that you do. Your staff is very nice. Our stay was comfort and relaxing. We had everything we could want and loves the decor of the Biachi condo. 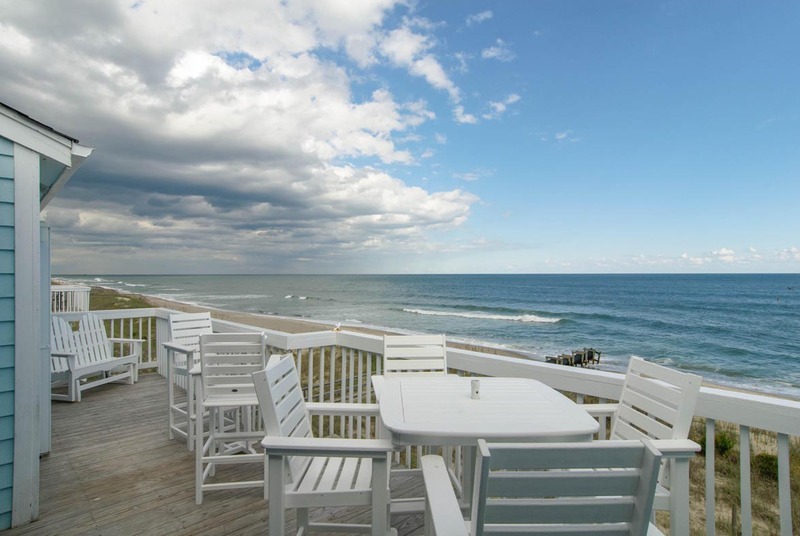 Vacation is always memorable in Kure Beach- our stay in Bianchi was top notch. We have rented through Bryant several times in the past and their customer service has give from good to great. They called with questions an d were extremely helpful all The time. The unit is gorgeous and it felt like home from the moment we entered. Well equipped and perfect. We go to Kure beach every year with our family of four and look forward to it all year. We have been staying at the ocean dunes for the past 4 years. This condo was nicely updated however the cleanliness was not as we expected. Upon arrival we found personal items left in both showers, goes to show how well the showers were cleaned....not at all!! We did call Bryant realty and they were very nice to send someone over however all they did was collect the items out of the showers and leave!! No cleaning ever occurred!! We had to go through and do a cleaning on the condo ourselves!! I do not think the first thing you should have to do on vacation is clean the condo you are paying this much for. We love the area, prob will not stay with Bryant again unless they change their cleaning policy or companies. If I were the owner of this unit I would not be pleased either, blinds were broken off and just curled up in the corner. The bifold doors to the washer and dryer was broke as well. The unit really needed a good cleaning. Dust bunnies on the ceiling by the air vents and walls were dirty. Not what I expected for the price we paid. We left the place in better shape than when we checked in. Also had a half empty bottle of vodka on the counter when we arrived. Just not impressed at all but cleaned it ourself and moved on. Hi Jerrad- thank you for your feedback. We are sorry to hear about the state of the unit upon your arrival. We strive for perfection with our housekeeping, maintenance, and reservations staff, but at times fall short. This is one of those times. I can report that the cleaner who was responsible for getting this unit ready for check-in is no longer a part of our team. We apologize again for your underwhelming stay, but want to assure you that this is not our standard and is not something we tolerate. We hope you will give us the opportunity to prove that to you. Beautiful rental unit. Nicely decorated, very clean! We enjoyed our stay and would recommend staying here to others. Beautiful views, steps away from the pool and the beach! Loved it! perfect unit for our family of four (2 adults, 2 teenage boys). the patio and it's ocean views are amazing, right next to the outdoor pool and boardwalk to the beach. strong wifi and cable tv made our teens very happy too. kitchen is extremely well stocked with cookware, utensils, glasses, etc. And the extra beverage cooler was perfect for keeping our beer and bottled water nice and cold. Beds were comfy, bathrooms and showers were beautifully tiled and clean and the living room furniture was cozy and roomy. everyone agreed we need to come back again soon. It was a great place to stay and relax for us all. Some of the best pictures were taken from our balcony and seeing all the dolphins that came by in the mornings and the birds that were beautiful as well. We will be back that way again in the future!! Thanks so much for letting us experience this condo the past week!! Kure Beach at it's finest! This property is in a good location and the view is fantastic! The condo was well kept and spotless! You should be aware that there is little or no beach available when the tide is high and that access to the condo is up three (short) flights of stairs. Easy to find and close to many great restaurants and attractions. Catch the ferry over to Southport and spend the day; you won't regret it! We will definitely be returning! This was our 2nd stay at Bianchi. We love this condo. The beach is quiet here and the bike lanes are awesome. We rode our bikes every day and walked the beautiful beach. The small family owned businesses are refreshing and the fact that chain restaurants are not there is great. We are considering retiring in this area in a few years. We will be back for sure. What a lovely little spot. The condo is not large, but has everything needed for a great getaway. We loved the large patio, and the amazing view with just a short walk to the ocean. The furniture is in great shape, and the condo is VERY clean and well maintained. The stairs were not an issue, as we thought they might be. My only negative comment would be the front bedroom with the two twin beds definitely needs a ceiling fan as the AC just doesn't work well back there. All-in-all though a great spot and well worth the cost with the proximity to the ocean. I would highly recommend it! Beautiful escape from the real world. I had the best rental experience with Bryant Realty. Bryant Realty was very quick to respond to my emails prior to choosing my rental condo. I have been staying in Ocean Dunes at Kure Beach for the last 20 some years and will continue to return. The condo was clean and well maintained. The home owners put alot of thought and pride into this condo. We had a very enjoyable weekend at this beautifully furnished and decorated condo. We were on the second floor with the deck overlooking the ocean and the wonderful sound of surf when we had the doors open with the screens in use was our constant companion. There were a few small negatives - a faulty switch for the overhead kitchen light, a loose hinge for the kitchen corner cupboard, crumbs on the sofa bed mattress pad, which we padded with some of the twenty or more extra pillows in the bedroom closets, bathroom rugs that had not been washed before our stay ( I washed them in the washing machine which had a bad odor.) However, none of these issues negatively impacted our happiness at being in such glorious surroundings. Of course, we walked on the beach and out to the end of the pier (about 2-1/3 miles round trip), took pictures of the resident, very spoiled pelican. We enjoyed dinner at Michael's Seafood in adjoining town Carolina Beach. We would have liked to eat at the Shuckin' Shavk in Kure Beach(the fresh seafood looked awesome) but couldn't get a seat at 6:30 on a Saturday evening. We had a good time walking around Ft. Fisher park and reading about all the Civil War history that happened there. We also arrived in Kure Beach via the Ft. Fisher ferry from Southport, which I loved. All in all, we had a greatt time and would definately stay at Bianchi again. needs a breakfast table to eat at, not counter facing away from ocean view. flooring very creaky in master bed and bath. floors not sound proof. Great view from the deck and proximity to the beach. Our second time here and no regrets. 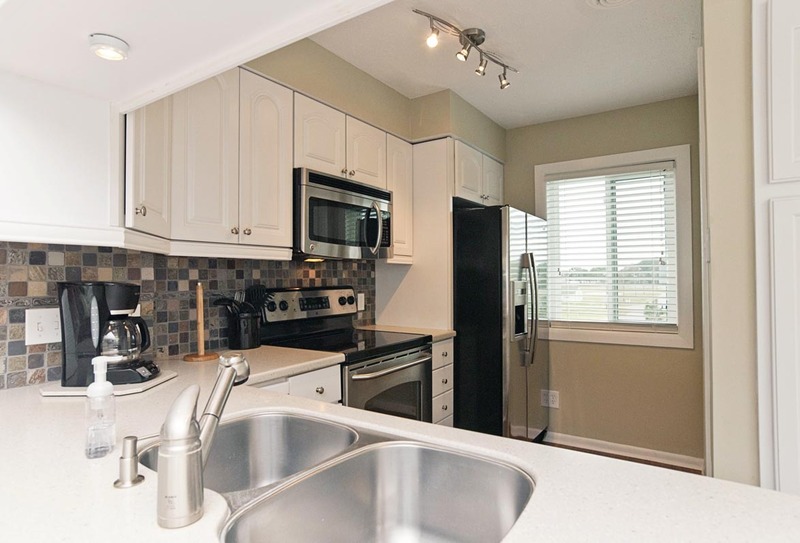 Nicely appointed and quiet, family-oriented condo complex. Our place comfortably sleeps four. Clean pool and ocean just a short walk downstairs. Awesome! Very nice stay! Beautiful house and nice location. Owner Should list that property is on third floor in advertising..
Condo had everything we needed. Good washer and dryer which is always a plus. Very clean and well maintained. This was a beautiful condo and the location could not have been more perfect! Hope to visit again and would definitely rent this property again. Myself my wife and young son had the pleasure of spending 7 days at the Bianchi condo and so wished it had been longer ( hindsight is a wonderful thing). The views are simply amazing. With quiet beaches even during peak times we could not really come down this more. 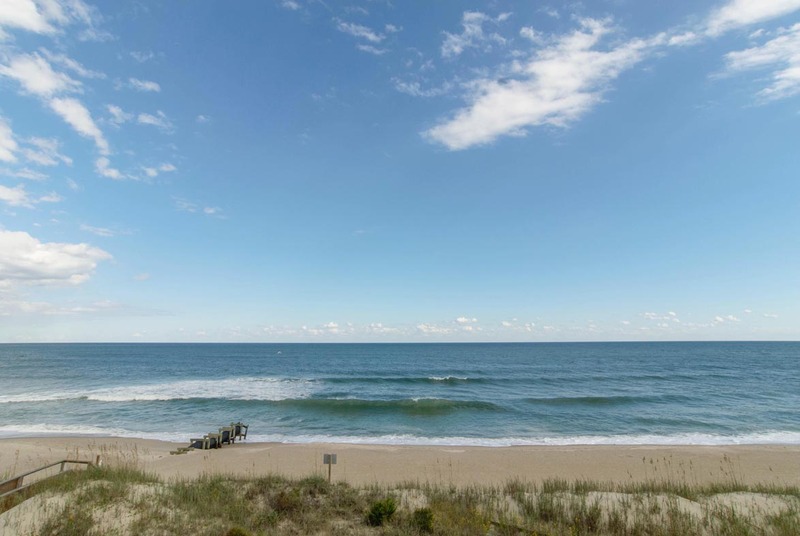 As we decided to Marry on kure beach (outside the condo turned out to be the perfect location at sunset ) we will most certainly be back and have no hesitation in recommending this beautiful decorated and spacious condo. Bianchi had been remodeled and is amazing. The kitchen is updated and very clean, there is pantry space for groceries, ceiling fans in all of the bedrooms and the master rain shower head is an added bonus. We had a few issues that Bryant took care of quickly and with minimal interruptions to our vacation time. Check in and out was a breeze. We will hope to stay again! Thank you for sharing your home with us! Perfect location between the walkway to the beach, and the outdoor pool. I think we've found the rental we'll be coming to every year!!! Bianchi-condo-2 bedroom-2 bath. Beautiful modern decor. The Bianchi Unit was exactly as shown - fantasatic. Rental was in great condition and well situated on the beach. Facilities were great. The couple times that we needed help (very minor issues) from Bryant Real Estate, they were prompt and responsive. we would absolutely stay here again when visiting Kure beach. Condo was updated and very clean. 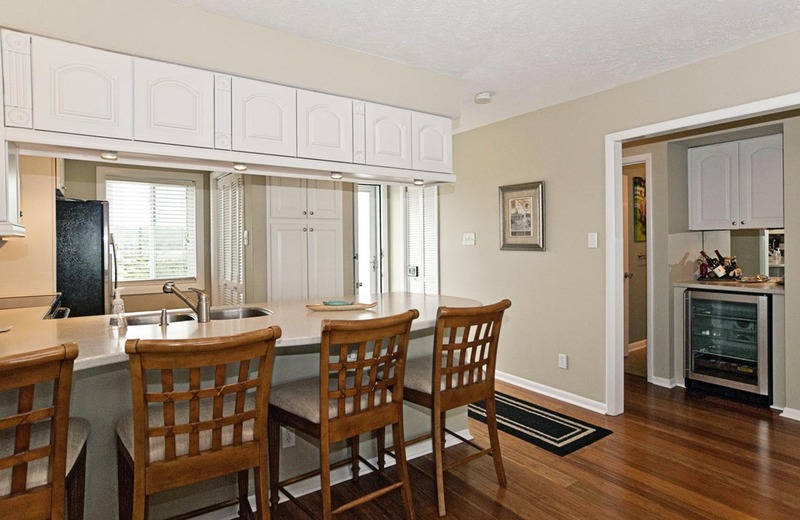 The kitchen was stocked and the the separate wine fridge is very useful for vacationers. The view fro the condo is the best I've experienced in many years of renting. The location was perfect. 1 unit over from a private beach access and a 10 second walk to the pool. Half mile or so to the ft fisher center and just south of that is the aquarium and ferry to southport. We would love to have many more visits to kure beach. Beautiful ocean view on the third floor. This condo has everything you need for a stay. Lovely decorations and furniture. Only wished it had a table in addition to the lovely counter/stools. Would stay here again! Overall I was very pleased with the condo and am considering it for another stay. An elevator would be nice but recognize that is a rare amenity. Had a great time. Loved the location and community. Great walks up to Ft Fisher every morning. Only one recommendation. The threshold strip going into the master bedroom has a nail that sticks up and I cut my foot because you don't know it's there until you step on it. It should be fixed before someone (not so understanding) gets hurt and decides to be ugly about it. Other than that, it was great. Hope to come back. Many thanks to Bryant Real Estate and the Bianchi Family for making our vacation to Kure perfect. Check in/out was easy. Staff were helpful. The condo was clean, spacious, and recently updated. We definitely plan to use both the agency and the location again. This condo was perfect! Lovely furnishings, upgraded kitchen, and the view was incredible! We had a minor issue with the A.C.our first day but the folks at Bryant had someone out right away and the problem was solved very quickly. Thank you! 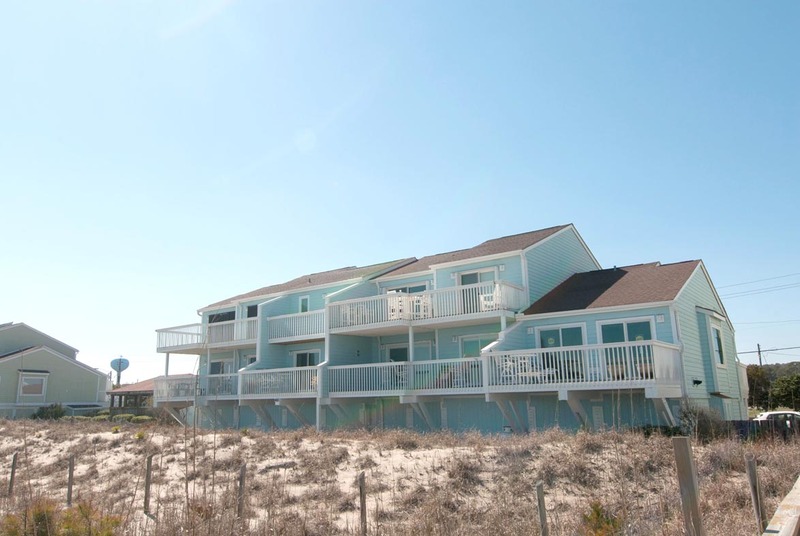 Kure Beach is our favorite beach destination and we have stayed in other rentals in town. This one is by far the best! Thank you Bianchi family for sharing your piece of paradise and thanks to Bryant Real Estate for taking such good care of us! While we have stayed about seven times in Carolina Beach across several locations, this was out first time staying in Kure Beach. We really enjoyed our stay and appreciated the quiet, residential, family-oriented atmosphere of Kure Beach. The beach was a short walk from the condo and there was plenty of room on the beach to enjoy the ocean without feeling it was overpopulated. The condo itself was well-appointed and the deck afforded an awesome view of the ocean...just spectacular listening to the surf. There was an issue with the A/C unit during our stay and the management company was quick to respond and courteous. They got the unit running again and an HVAC team was dispatched the next day to make the necessary repairs with a minimum of disturbance to us. The location is great...short hop to Wilmington for evening excursions. Also took the ferry to Southport and hopped a ferry there to Bald Head Island for the day. Other than that, the pool was nice and not too busy. We played tennis at the rec center once in the evening and that was fun. It would be nice if the condo outdoor pool was open a bit later to appreciate some quiet nighttime swimming but I also appreciate the residential nature of the area and wouldn't want to change that. We would definitely consider visiting again. Matt- Great to hear everyone enjoyed their visit to the beach! Hope to see you again soon! The rental was probably the best we have stayed in at Ocean Dunes yet. Very well equipped for your stay. We loved our stay at Kure Beach. The condo was beautiful and included everything we needed. The deck offered a beautiful view of the ocean. The beach was close, quiet and easily accessible. The area was not very commercialized and offered peace and quiet. Lots of places to run and bike. The fort, state park and acquarium are nice to visit. We would highly recommend it! Chris- Happy to hear everyone enjoyed their stay! Stayed at this rental with my husband, parents and 2 year old daughter. Very quiet place, loved the view from the deck and the condo was clean and spacious. Neighbors are extremely friendly! Loved that the beach is calm and not at all crowded. 5 minutes from anything you would want to do, my daughter loved the aquarium which is right down the street and the arcade at the pier! Will definitely be going back! Amber- Glad to hear you'll be back! Very beautiful and comfortable condo! Everything we needed was there. The view from the balcony is great! Located from à short run to the fishing pier and some restaurants. We discovered the "veggie wagon" too late in our stay.. Must have to go to this store with a lot of local products. This is a super nice condo with an ocean view -- which provided awesome sunrises and sunsets. The condo was extremely comfortable and very well cared for by the owners. The house is quite nicely furnished! We loved the location, too! We had a fabulous time during our stay. We're planning our next beach vacation, and plan to return!!! Well done and bravo! Doris- We are glad to hear you enjoyed the condo! See you next year!! We had a great time at the Bianchi Condo. The condo was nice and everything we needed was available. Stephnie at Byrant was great to work with at the last minute. I do have one note for the unit. The floor at the master bedroom and master bath is weak. It is just inside and outside of the bathroom door. It makes a sound.I do some carpentry work. It will need to be addressed in the near future. I would have someone look at it. We enjoyed our vacation. Thank you. William- Happy to hear you enjoyed your week at Bianchi! Hope you'll visit again soon!